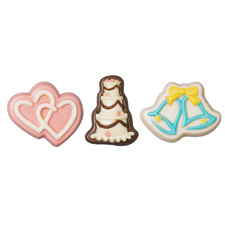 Favor handmade wedding candy molds love into a delicious piece of chocolate. It has been said, "Forget Love. . .I'd rather fall in chocolate!" 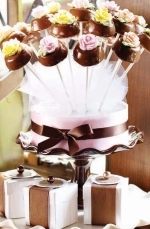 You can have both love and chocolate with these homemade wedding favor ideas! A chocolate wedding favor unique in every way is a delicious piece of chocolate that you have molded into a shape that perfectly fits your wedding day. Your guests will savor the taste of the wedding favors you make by following these easy steps. First, you need to purchase your materials, which are chocolates to melt and chocolate molds. Most people claim Wilton chocolates are the easiest to melt and work with when making wedding favors. Chocolates come in a variety of colors so make sure to color coordinate them to your wedding or you could just stick with the basic dark brown. If you are planning an all white wedding, then white chocolate is your choice. You will then melt your chocolates in the microwave or on the stovetop with a double boiler. An easy way to create a double boiler is to place your chocolate in a coffee mug inside a large pot of boiling water. Then you will pour your melted chocolate into custom candy molds of your choice. There is an unlimited array of chocolate mold designs. Make sure to pick a mold that fits you and your groom's personalities. You could make chocolates in the shape of the classic wedding objects such as wedding cakes, wedding bells, hearts, a bride, or a groom. You could make chocolate flowers to match your wedding flowers. You could really think outside the box and make chocolates in the shape of your favorite pet, your groom's favorite sports team, or you college alma mater. You don't have to create just one! Create a variety of chocolates that share meaningful things about you and your groom's life. Once you have poured the chocolate into your plastic chocolate candy molds, shake it carefully removing all bubbles. Place molds in the refrigerator and allow them to cool and solidify. Then pop them out and place them in clear cellophane bags. Tie color coordinated ribbon around the top and include a gift tag. Create chocolates with wedding candy molds in the shape of the first letter of your new last name. These monogrammed chocolates will add a modern twist to your chocolate favor wedding gifts.